We are two months into the New Year. How is your New Year's Resolutions coming? I really did not make any resolutions this year. I do have goals set and as a family we are striving to meet those goals. There is two things that I need to be better at. The better I am at them the more closer I am at meeting our family goals. First thing is I need to start eating better, I need to out the bad food for organic and healthier food options. The second item is I need to start packing our lunches for school and work. 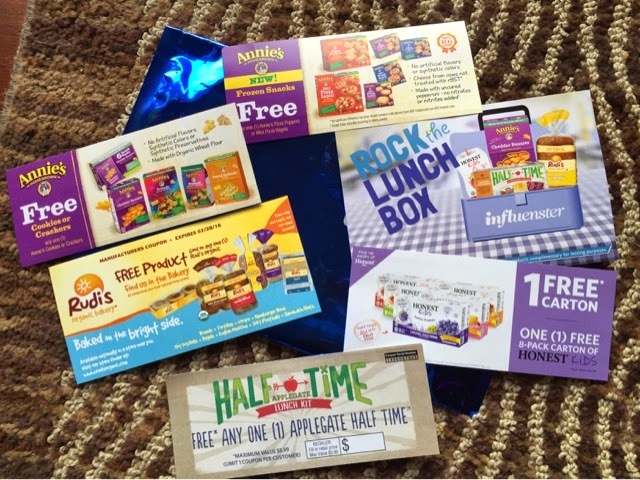 What better time of the year to get chosen for a VoxBox called Rock The Lunch Box from Influester. Inside my VoxBox was 5 coupons with the word FREE on them. The coupons were for Annie's Crackers, Honest Kids Juice, Rudis Bakery Bread, Applegate Half Time, and for Annie's Frozen Snacks. My favorite was the Honest Organic Juice. We tried the grape. My kids love it. At first I thought it was watered down, but it was reality it was just because all of the harmful ingredients that is in other juices are not in this juice. Thats what I like about this drink. My kids would rather drink this instead of the other leading juices on the market. Out of all the products I did not find any product that I would not buy again. I really liked how everything tasted. Everything was easy to find at my local grocery store. I will differently be buying these products over other products in the store. Please note I received these products complimentary for testing purposes only from Influenster. My opinion has not been altered due to the products being tested. My honest truth has been given and as a mother of two who is wanting to change our eating lifestyle I honestly will say these products are mother and kid approved. Have you tried any of these products? I would love to hear your thoughts.